Crystallization is a ubiquitous process involving the formation of solid crystals. Crystal formation may occur via a number of processes, including cooling and evaporation, under a variety of conditions. A critical unit operation in pharmaceutical active ingredient production is crystallization. During this process, API's undergo crystal engineering in order to assure that the final desired crystalling form is produced. Raman spectroscopy is a praticularly effective tool for the characterization of different types of crystalline forms of the same material (polymorphic forms). The reason is that the moecules in crystalline materials are, by definition, ordered in a specific manner. As a results, the Raman spectra of crystalline materials give rise to very sharp and intense bands. In addition a chemical moiety in one crystalline form may exist in a different environment from the same moiety in another form leading to band shifts. These band shifts can be characteristic of one polymorphic form and be used to qualitatively identify and quantitatively measure the polymorphic composition. 3. Assure that the Correct Polymorph has been Formed. 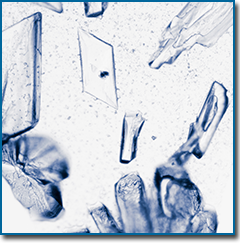 The ability to characterize, optimize, and control the crystallization process, polymorphic forms and co-crystals are thus industrially critical. Raman spectroscopy enables in situ, non-destructive and fast quantitative measurements to meet these needs as well as offering the ability to analyze forms non-destructively in a manner that is scalable from Discovery to Manufacturing.